Hello there! 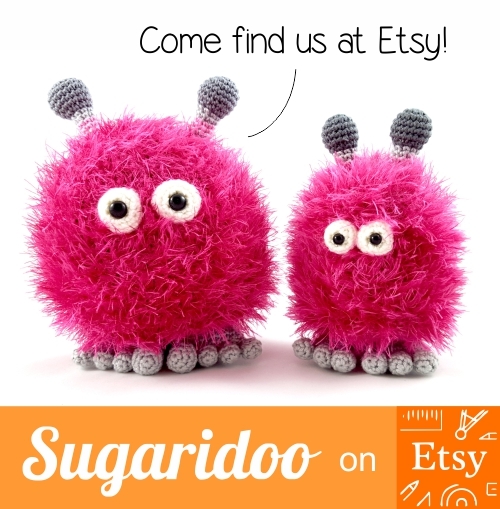 So nice to have you here on Sugaridoo. 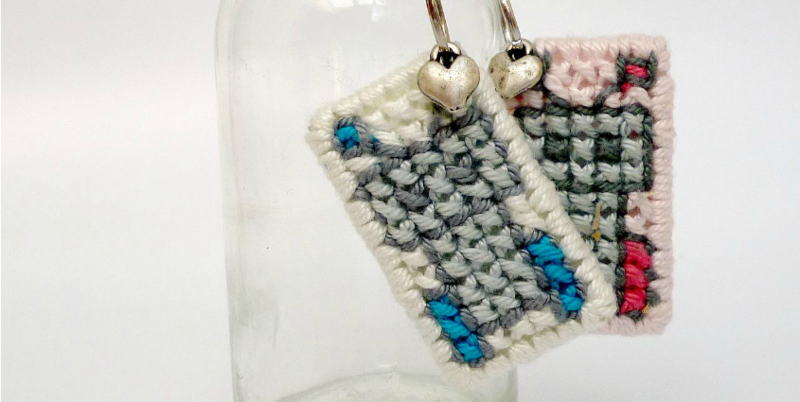 Want to learn to stitch on plastic canvas? Read on! 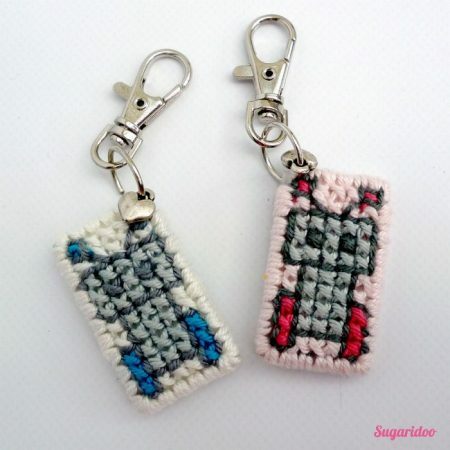 We’ll be doing a tutorial on how to make these cool robot key chains. 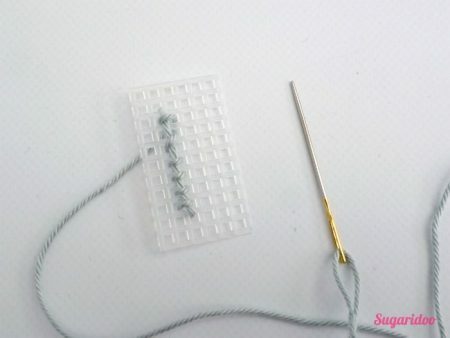 All aspects of cross stitching on plastic canvas will be covered. There are so many options for using this technique. 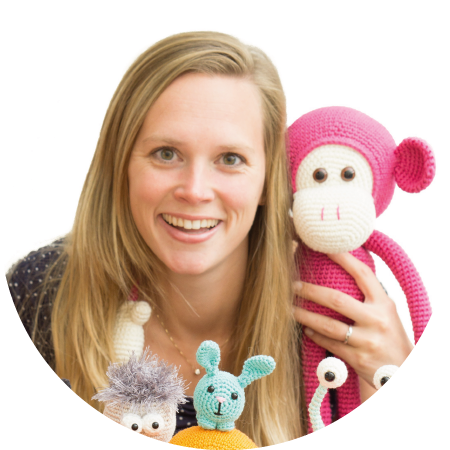 Please share in the comments what you are making, I’d love to know! 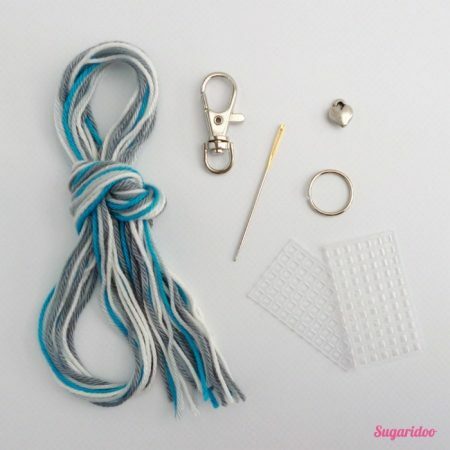 All materials are available as a kit in the Sugaridoo Etsy shop: Robot DIY kit. We begin by attaching our first thread. Don’t tie a knot. 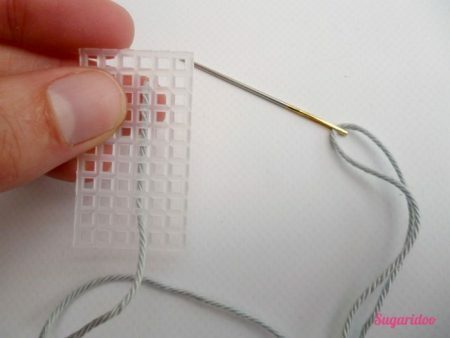 Just thread your needle and hold the end of the thread at the back side of the canvas. 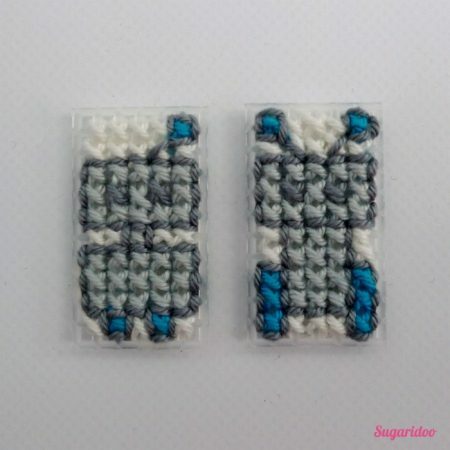 Want to know how more about making cross stitches? 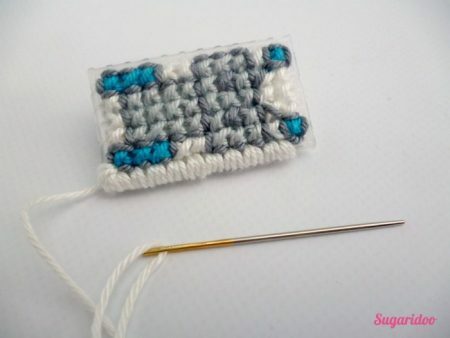 Check this beginners Cross Stitch Tutorial. 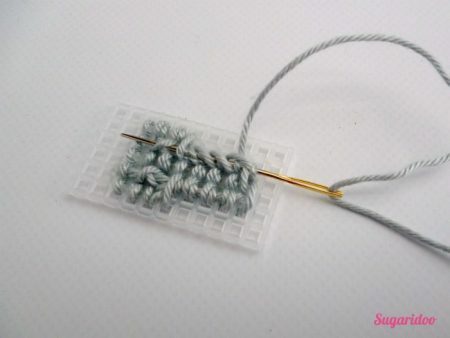 Make your first row of half cross stitches, make sure you stitch around the thread end at the back. Here you see the front. And this is the thread end at the back, all tangled up in the stitches. 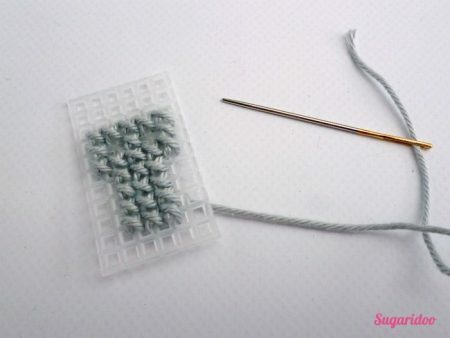 After you secured the thread end at the back you can continue making cross stitches. When you come to the end of your thread, bring it to the back of your work. 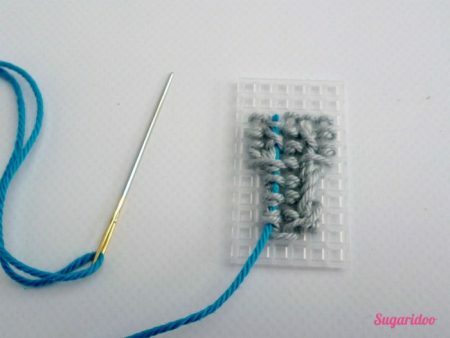 Wiggle the needle through a row of stitches and pull it through. When it’s secured, just cut the tail of the tread sort. Starting with a second thread is already easier than the first one. 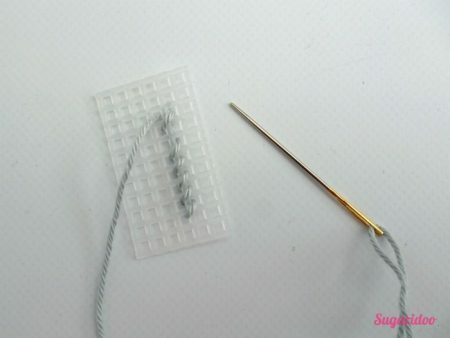 Just wiggle your needle through some stitches at the back and you are ready to go. 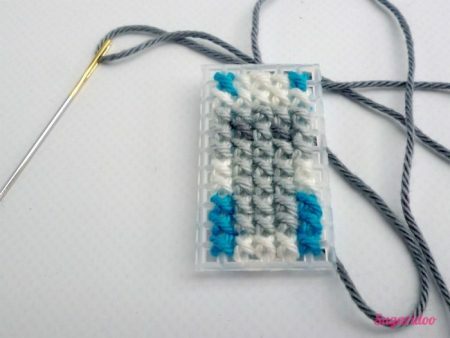 After all cross stitches are done you can make the back stitches. Don’t pull them too hard, just tight enough will do. They give a nice detail to your work don’t you think? 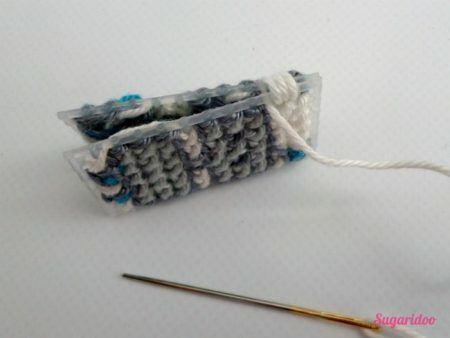 You can learn more on how to make back stitches in This Tutorial. 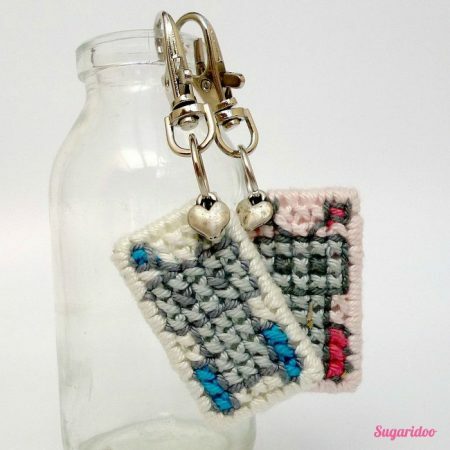 So now both sides of the key chain are finished. We only need to sew them together. Attach a thread to the back of one of the robots and pull it to the front in a square on the side. Place the robots back to back and start looping around the side. I did three stitches per square as you can see below. This fills up the sides really nicely. Continue until you reach the end of your thread. Wiggle the needle in between the two robots, trying to catch some stitches at the back. Then pull through and cut off the thread. Same for attaching the next thread, wiggle it in between the robots. Try to get your needle through a few stitches at the back so the thread will stay in place. In the corners you can loop about 5 or 6 times. Leave one top corner open to be able to attach the little ring there. Here you see the open top right corner and the key chain supplies. 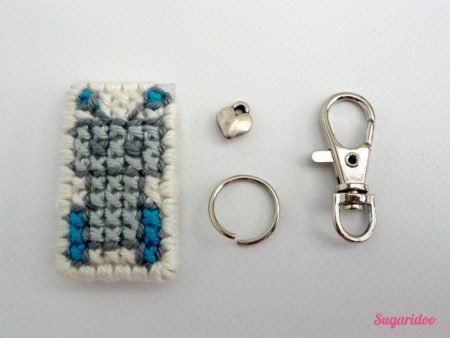 Open the little ring, pull it through the top corner and attach the key clip and charm. And that’s it. You’re done, good job! There are endless possibilities with this material, I love to see what you are making. Just leave a comment to let me know what you are working on.